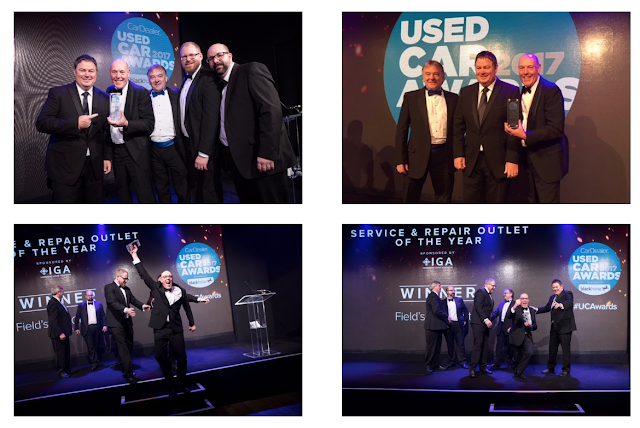 With the Oscar season upon us, it is with great pleasure that the Good Garage Scheme extends congratulations to the team at Fields Car Centre in Woking for recently winning Independent Garage of the Year (Southern England) in Workshop Magazine's 2017 Awards. The evening, held at the Brewery in London's Barbican district, was hosted by Mike Brewer, star of TV's 'Wheeler Dealers' who presented the awards. Mike and Richard Field were astonished when they were announced as winners as were the team, which included workshop managers, Chris Maple and Gary Churcher, who were also speechless. As you can see from the photos from the night, disbelief soon turned into happy celebrations. Mike Field said, "... one of the most amazing experiences as we walked from the back of the room to the stage, some 100 feet away, past table after table of guests, all applauding Field's Car Centre from Woking! I cannot put into words the feeling of such a moment. You can't buy this type of experience; you can't prepare for it as you don't expect it." For more information about Fields Car Centre, visit their page here.